Developed strictly in accordance with industry requirements, Herkules groove grinders combine a number of advantages. The machines' longevity and their top performance guarantee their success in your production facility. Quality down to the last detail – all machine components consist of very stable cast-iron elements with excellent damping properties and a high rigidity for nearly vibration-free machining. 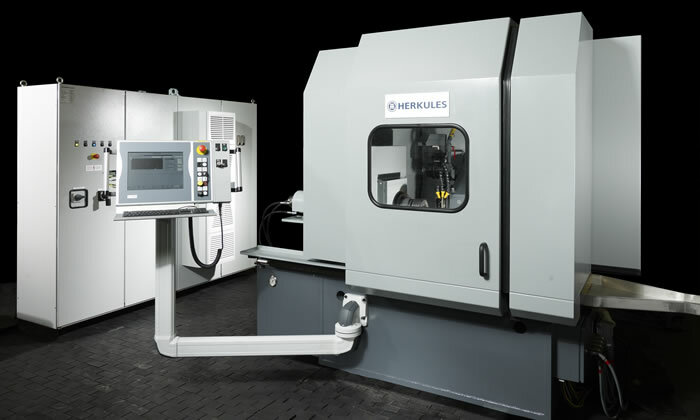 Minimized set-up and machining times are also characteristic for Herkules groove grinders. The hydraulic clamping device is integrated in the main axis and allows for an absolutely accurate changeover of workpieces within seconds. This minimizes typical non-productive times for changing tools. 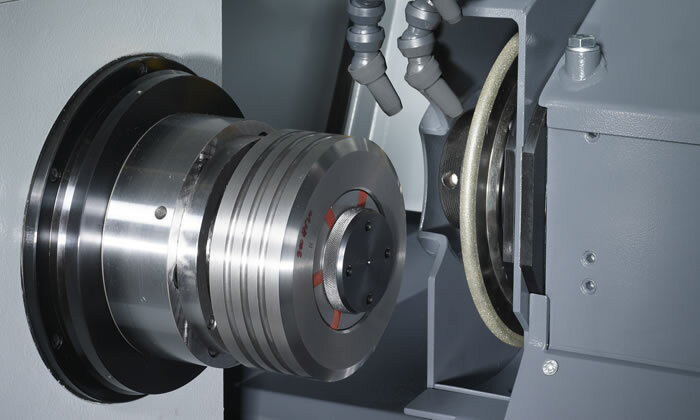 The generously dimensioned grinding spindle, which is mounted radially and axially entirely free of play, reduces grinding times significantly. The design of our groove grinders is the result of many years' experience gathered by Herkules in manufacturing first-rate roll grinders and lathes. Guideways and bearings have been developed according to the latest technological developments and optimized with a view to longevity and ease of maintenance. The solid construction of the machine allows for high grinding pressures, i.e. large feed values, and therefore ensures the shortest machining times. The elimination of vibration, another result of the machines' robust construction, is decisive for a long wheel life and therefore economical grinding. The machine bedplate is ribbed to prevent vibration and made of high-quality special concrete. The saddle guides are hardened steel rails on which the saddle is guided by linear roller bearings. This arrangement virtually excludes any wear of the bedguides. The headstock mounted on the machine bed is made of high-quality cast iron. It is designed for a long service life even under the heaviest machining operations. The sturdy main spindle is set to run without any play in the roller bearings by means of separately adjustable radial and axial elements. The headstock is driven by an infinitely variable frequency controlled AC servo motor. Its layout guarantees the wide speed range needed for the different grinding methods. The tailstock features a robust design and a sturdy construction. The tailstock is moved along the bed with rack and pinion. This arrangement allows for moving the tailstock to any chosen position. The main advantage of this construction is that centers never have to be moved far out of the tailstock housing. Thus, stability is guaranteed at all times. In order to achieve high performance and precision for machining operations, the grinding saddle is also manufactured of high-quality machine cast. Longitudinal movements and saddle infeed are carried out by the help of a play-free, oversized ball screw spindle. The saddle infeed is fully integrated in the machine control. In addition to automated movements, manual adjustments can be made using an electronic handwheel. The grinding shaft rests on over-dimensioned bearings and can be adjusted to minimum play. Thanks to its generous dimensions, the grinding wheel is suited for high speeds. Absence of vibration is critical for a long wheel life and economic grinding. The logo milling device mills numbers or letters into the grooves of rod mill rolls or TC rolling rings in order to mark your product as per your specification. The device is integrated in the machine and necessary movements are realized by the machine axes. Numbers or letters are programmed on the CNC control by entering relevant data on a graphic screen. For rebar manufacturers, Herkules offers a notch milling device which is directly mounted on the grinding saddle and can machine large constructional steel sections with diameters of up to 50 mm. This device measures the depth and the exact position of the grooves. The automatic measuring device is fixed at the grinding saddle and automatically swivelled into the working position. The device is integrated in the machine and all necessary movements are realized by the machine axes. The measuring device works automatically and can be activated at any time. Herkules groove grinders are designed to deliver peak performance for your applications. If desired, larger dimensions can be realized.